You will note, however, the use of italics…but we’ll get back to that in a moment. First, let’s focus on the one thing about “Bob’s Burgers” that is absolutely undeniable: H. Jon Benjamin is a god amongst adult animation voiceover actors. As is the case with far too many voice actors, even if you don’t know Benjamin’s name, you most likely know his work. He’s Ben Katz on “Dr. Katz, Professional Therapist.” He’s Jason, Perry, and – yes! – Coach McGuirk on “Home Movies.” He was part of “O’Grady,” an underrated animated series that aired on The N, as well as the coulda-been-a-contender “Freak Show,” which David Cross still laments as one of the great missed opportunities of his career. Then there’s “Lucy: Daughter of the Devil,” “Assy McGee,” and, most recently, FX’s “Archer,” where he plays the title character. 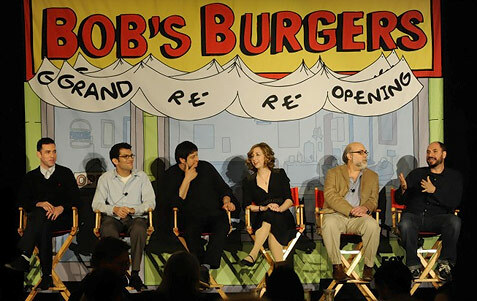 Here, Benjamin is Bob, proprietor of a self-named burger joint that he runs with the help of his wife, Tina (Dan Mintz), and his kids Gene (Eugene Mirman), Linda (John Roberts), and Louise (Kristen Schaal). 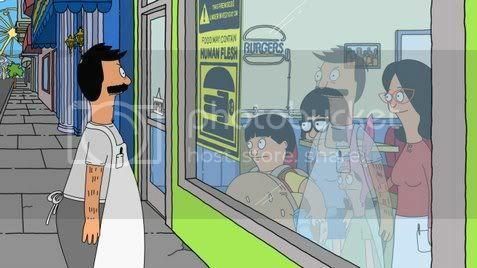 Even though he’s married with three children, Bob’s Burgers is really the end-all and be-all of Bob’s existence, with his intensity in keeping the restaurant rolling along such that he regularly forgets his wedding anniversary, his wife’s birthday…even his own birthday. Fortunately, Tina is so self-absorbed, not to mention slightly delusional, that they’ve managed to maintain their successfully dysfunctional relationship for many years now. As for the kids, Gene would seem to be a budding prop comedian (when outside the restaurant, wearing a giant burger costume and passing out samples, he regularly plays with a megaphone that makes fart noises), Linda’s destined for a life as a social outcast (she spends the pilot complaining about her nasty case of crotch itch), and Louise is disconcertingly cheery but seems to have no understanding of what’s socially acceptable (she changes the name of the Burger of the Day to “The Child Molester” and tells her class that Bob makes his burgers out of corpses from the funeral parlor next door)…but, of course, all of these character traits could change, since – as noted – all we’ve seen so far is the pilot. And, say, how about that pilot? 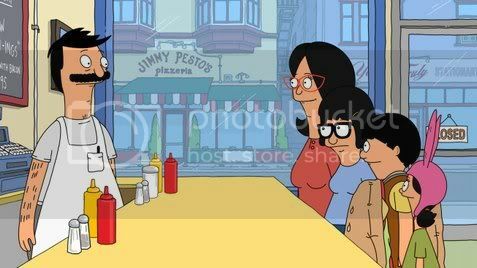 Family sitcoms may be a dime a dozen, particularly animated ones, but the concept of a family-owned restaurant is fun, and I like the idea that Bob’s so obsessed with his burger joint that his response to Linda’s question about her itchy crotch is, “Are you asking me as my daughter, or are you asking me as my cook? Because my cook wouldn’t ask me that.” But even though Louise’s antics are funny, you can’t help but think that any kid who’s smart enough to find humor in the idea of naming a burger “The Child Molester” is also smart enough to know the effect it could have on her father’s business. All told, I wanted to like “Bob’s Burgers” decidedly more than I actually did, but thanks to the fact that it reunites Benjamin with series creator Loren Bouchard, his collaborator on two of his greatest creative successes (“Dr. Katz” and “Home Movies”), I still want to give it the benefit of the doubt that it’s salvageable. To be worth watching on a regular basis, Bouchard is going to have to lose the lowbrow that permeates way too much of “Bob’s Burgers,” embrace the uniqueness of the premise, and keep things grounded in reality rather than ridiculousness. Like I said at the beginning, I’m hoping the series will grow more appetizing in the weeks ahead, but I know it’s a tall order to fill, and my expectations are realistic: since I’m pretty sure the ingredients that leave the worst taste in my mouth are what led Fox to greenlight the series in the first place, I’m resigned to leaving “Bob’s Burgers” still hungry for laughs. I don’t know what it is about “Aqua Teen Hunger Force” that causes me to be forever surprised at how funny it is, but I think perhaps it’s because the concept is so downright surreal. Nonetheless, “Aqua Teen Hunger Force 6” (which actually contains the whole of Season 5 of the series) contains just as many laughs as the previous collections. 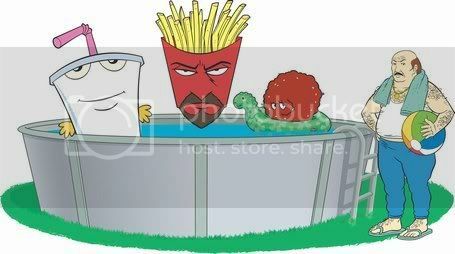 The first few episodes, however, feature little or no appearances from Frylock, Master Shake, and Meatwad, due to their being cocooned in the desert by their vampire-esque landlord Marcula; ever the caring neighbor, Carl immediately tries to rent out their place to a bunch of robots, but his greatest spotlight comes in the third episode, “Sirens,” when he meets another set of new neighbors, voiced by Kelly Hogan, Neko Case, and John Kruk. (Kruk plays himself; the other two do not.) Other guest voices during the season include David Cross, T-Pain, Josh Homme (Queens of the Stone Age), Scott Adsit (“30 Rock”), Jon Benjamin (a.k.a. Coach McGuirk on “Home Movies”), and Kristen Schaal (“Flight of the Conchords”). There are four previously-unaired episodes, the best of which is “Shake Like Me,” where Master Shake is bitten by a radioactive black man and becomes black himself. Scientifically implausible, you say? Surely no more so than an anthropomorphic Happy Meal. Of the special features, sports fans will particularly enjoy the “Carl’s Pissed” shorts, where the hairy undershirt-wearing gentleman moans and groans about various events in the world of sports, but there are also other oddities that fans of the show’s bizarre comedic sensibilities will enjoy. Those who do not belong to the Adult Swim cult, however, will almost certainly not…and that goes not just for the bonus material but also for “Aqua Teen Hunger Force” as a whole.